Taking everything right back to basics, this online slot from Playson offers 5 paylines across 3 x 3 reels, and has both feet firmly planted inside the ‘traditional’ genre. It’s an old fashioned fruit machine brought back to life as a slot game, with an RTP of 96.21%. We’re happy to offer Burning Wins to players right here at UK Slot Games, where we also offer over 600 slot games, including ‘Starburst’, ‘Rainbow Riches’, ‘Fluffy Favourites’ and ‘Bonanza’. In the modern age of gaming, there are slots to please all tastes. There are online slots available for high rolling players. There are slot games for more conservative budgets. There are games based around people’s favourite movies, bands and superheros. In the race to make sure that every single customer is satisfied, games have been built around almost every theme imaginable. But there still is - and always will be - something to be said for the classic and the traditional. When it comes to classic and traditional, you can’t get much more back to basics than this. Playson’s Burning Wins may have been released in 2018, but the game’s intention is to take you right back to the experience of playing an old-fashioned fruit machine in an arcade somewhere. This may be the closest you get to recreating that experience without walking out into the cold and the wet of Blackpool’s North Pier! When we say fruit machine, we mean fruit machine. You’ll see no over the top graphical touches or out of place animations here. The background is a neutral purple, save for the game’s logo in the top left hand corner. There’s no theme here, so there’s nothing to theme the background around. The reels are also the same plain colour, framed by a thin strip of gold, which gives the playing area an almost regal touch. This is a game which is treating its format with respect. Considering the game has only three reels and three rows, and offers only five paying lines across those reels, you might be wondering how it’s able to offer an RTP of 96.21%. The answer is that it doesn’t involve too many symbols. There may be comparatively fewer reels, but by limiting the number of symbols, the game makes it easier for you to find those winning lines with some regularity. On those reels, just as you’d expect, you’ll find cherries, oranges, lemons, plums, watermelons, the bar symbol, some bells, and the lucky sevens. Find a winning line, and you’ll encounter the game’s one slight hint of flair; the symbols which make up your winning line catch fire. That’s where the ‘Burning’ part of ‘Burning Wins’ comes from! It’s the sevens you’ll want to find more than anything else; they’re your route to the game’s maximum jackpot, which comes in at 300x your initial stake. The lowest possible win comes from finding cherries, which will pay 35x your line bet. They’re not the largest potential winnings in the world, but they’re certainly not the smallest. You may have noticed that we haven’t talked about the wild, or the scatter symbols. That’s because there aren’t any. If you’re wondering what that means for the bonus features, then let us tell you. We know that might sound crazy for a game that was released in 2018, but there isn’t one single bonus feature to be found anywhere in Burning Wins. No wilds, no scatters, no side games, no free spins. Not even a gamble feature that allows you to wager your last win on a 50/50 chance. The Burning Wins base game is all you get. If that disappoints you, we understand. Not every player is going to love Burning Wins. Burning Wins shouldn’t be seen as an alternative to your usual favourite online slot, though. It’s not here to compete with the Rainbow Riches or Fluffy Favourites of the world, with their sophisticated features and expansive side games. That market is well catered for elsewhere, and with this title, Playson are looking to cater for gaming traditionalists who might otherwise feel overwhelmed when they come across a game that just has too many features for them to stay on top of. There is still a large audience of players out there who yearn for a nice, simple slot game where they just put their money in, spin the reels, and if their line comes up they get a win. It’s slot gaming at its purest and most straightforward. If that’s not for you, fair enough. If it is, then you may have found your ideal game. Playson are still a comparatively new company within the world of online slot developers. Based out in Malta, they were set up in 2012, but have expanded rapidly in their few years of operations. Today, they have offices in a number of major countries throughout the world, and are the employers of a workforce that numbers several hundred. Their growth has been boosted in the past three years in particular; they weren’t granted a license to operate within the UK until 2015, but having finally obtained one they’ve worked quickly to cater to the vast market within the United Kingdom. At the time of writing, they’ve developed and brought to market over forty slot games, with several more in development, and production appearing to be accelerating as they take on more staff. They make no secrets of the games they’re most proud of either; a quick look at the ‘About Us’ page of their website reveals that they have a special section dedicated to what they consider to be their best offerings. For the record, they’re Crystal Crush, Lucky Staxx, Wild Warriors, Fruits & Jokers, Book of Gold, Phoenix Fire, Claws vs Paws, Legend of Cleopatra and Crystal Land. Legend of Cleopatra in particular is the game that Playson are currently best known for. Whilst online slots are definitely the company’s main focus, they do also venture into other casino staples, such as blackjack and roulette, for which they provide physical machines to casinos. They’ve also been known to work with other developers to boost their reputation as they fight to establish themselves; past collaborations have included co-launched games with 1x2 Gaming and Pariplay. “Burning Wins by Playson is a new classic slot with 3x3 game field and 5 lines. A fruit machine that will be pleasing players all over the world. The company’s focus on appealing directly to hosting websites rather than directly to players is evident in that last line. Fortunately, we here at ukslotgames.com read it, gave it a play and agreed with them, so we’re happy to offer it here to you, our audience! 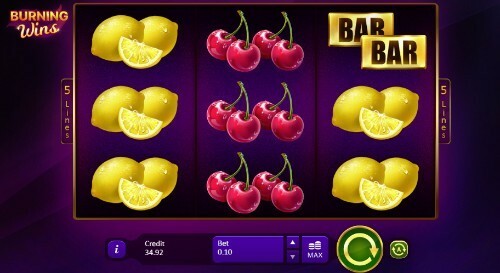 Even with all the recent development of online slots, and the literally hundreds of different themes that are available, the traditional fruit-based slot game is still probably the most popular. That means there are vast number of similar or related games out there on the market. The first place we look when we’re considering similar or related games is to the developer’s own roster, to see if they’ve released a sequel to the original, or any games that bear a resemblance. In the case of Playson, they’ve done both. Here’s the sequel to the original! Playson must have agonized over how to make a sequel to the original game without spoiling the appeal. If they changed the format, it would no longer be a traditional game, and therefore it wouldn’t have been Burning Wins anymore. If they changed virtually nothing, there was no point making a sequel before. In the end, we think they got it right. All that’s been changed is the addition of a 2x multiplier if you fill the reels with the same symbol; which makes the maximum jackpot an effective 1500x stake; and an additional ‘X’ symbol which wins your stake back if you find a line of them. RTP is boosted to 96.26%. Another Playson game which bears a strong resemblance to the original Burning Wins. In fact, the background and the symbols are so similar that we think they may have used Burning Wins as a template, and added to it. This is a game for people who enjoy the traditional theme, but do also appreciate something a little more modern when it comes to extra features. In Phoenix Fire, that ‘something more modern’ comes in the shape of a giant expanding Phoenix symbol, which arrives as a wild and then spreads its wings across the reels to find more winning lines. It’s a fine balance between the old and the new, and comes with an RTP of 96.05%. Another variation on the theme from Playson. Once again, everything is kept simple and clean here; but the key difference between this game and Burning Wins is that it’s played across five reels as opposed to three. Other than that, the only addition is a star symbol as a scatter, but it doesn’t actually enable any bonus rounds or features. This is just another take on traditionalism, with a wider play area and an RTP of 96.31%. Chances are if you enjoy Burning Wins, you’ll enjoy this game too. This was Playson’s first attempt at a traditional game, and it shows a little. Whilst it has the same dedication to basic gameplay, basic symbols and limited paylines that are a feature of Burning Wins, there’s a jaunty backing track accompanying the game which doesn’t feel right in context. The visuals aren’t as clean or sharp as the format that Playson eventually settled on, either. With five reels, fruit symbols and the same star scatter symbol as the one found in Sevens&Fruits, it feels like a weaker version of the later game. We’d recommend sticking to Playson’s other options if you enjoy the format. If we started talking about every single game that has used the old-school fruit machine as an inspiration, we’d all be here for the rest of our lives. Every developer who has a fruit-inspired slot game on its roster has copied that idea from somewhere. Given that every major developer has at least one (and usually more), we’d be drawing a line all the way back to the creation of slot games. Instead, let’s take a look at some of the more prominent offerings on the market. This is a more modern take on the classic format, and a product of the Iron Dog Studio. Although the majority of the symbols on the reels are fruit inspired, this game has been brought right into the modern age with five reels, four rows and 1024 ways to win, as well as three bonus features which include a free spins mode that comes with a number of extras. RTP is 96.06%. This may appeal to you if you like Burning Wins for the visual feel, but not if you like it for its simplicity. This might be the very closest thing to Burning Wins out there, and it’s made by Barcrest. It’s not visually as pretty as Burning Wins, but it’s three reels, three rows, and even has the fire motif, too. It also predates Burning Wins by several years, so we can’t help but wonder if Playson had seen this game when they were working on their own! RTP is lower than Playson’s offering, down at 95.10%, but it does offer one bonus feature in the shape of additional wilds if you’re prepared to pay for them. Tom Horn Gaming appear to have caught the ‘fruit and fire’ bug as well. This 2017 release has all the fruit symbols you’ve come to know and love, set against a backdrop that may well be in the deepest pits of Hades. This is a five reel, three row game with five paying lines and an RTP of 95.74%. It lags behind the Playson offerings in terms of how attractive it is to look at, but does have an additional ‘gamble’ feature which offers you the chance to double your last winnings, as well as scatters and wilds to offer the game a little more variance. Playson are relative newcomers to the online slot game, but they were formed at a time when mobile slots were already emerging as a popular format. For that reason, you’d expect them to have mobile slot development at the core of everything they do. That should mean that Burning Wins plays just as well on a smart phone or tablet as it does on a desktop computer or laptop. So does it? In a word: yes. Playing the game on a smart device, held in portrait mode as opposed to landscape, works perfectly. It’s a 100% accurate port of the game from one format to the other, in which nothing is lost, and the quality of the animation hasn’t suffered at all. All the buttons are where you’d expect them to be, and it’s easy to play. It doesn’t fare quite so well in portrait mode, where the translation feels a little lazy. The reels appear at the top of your screen, and the bottom half is given over purely to the ‘spin’ button. Whilst that doesn’t affect anything in terms of functionality, it does make the reels a little harder to see, and comes across as wasted space. We’ve seen portrait versions of slot games done much better than this, with more efficient and intelligent use of space. Pragmatic Play in particular make it their calling card. If you enjoy Burning Wins, you’ll enjoy it just as much on your phone as you do on your computer - just so long as you’re holding your phone the right way for the game! Not every online slot that gets released is fortunate enough to garner press attention, either in the mainstream media or within industry newsletters. As Burning Wins is a traditional game, it’s less likely to catch the eye or the imagination in the same way that a recently-licensed movie property might, or a novelty game that’s packed full of features usually does. Burning Wins suffers a little in terms of press attention for that exact reason. That doesn’t mean it never gets mentioned at all though. In December 2018, industry newsletter LCB ran an article covering another new Playson launch called Lucky Staxx. Within the article, the publication noted that Playson seemed to be making traditional games the focus of their range, and cited Burning Wins as an example of what they were talking about. It was also noted that 2018 has been another great year for the company, and one that’s seen them take strides into the Spanish market. At their current rate of growth, they’ll be in a position to challenge some of the world’s largest gaming developers within a couple of years. Why Is UK Slot Games The Best Place To Play Burning Wins? Burning Wins is a traditionalists dream. As the old-school fruit machine and the associated style becomes less popular, those who enjoy the format find it harder to play the types of game that they love. The problem gets worse when venues that own physical slot machines move the old ones out to replace them with more modern video slots. Therefore it’s always good news when a quality developer provides a fresh take on the genre. We hope that if you’re a fan of traditional games, you’ll love Burning Wins. It’s elegant, it’s simple, and it’s perfect for its purpose. If you’re a traditionalist and you’ve decided you want to give it a go; or if you’re a player who usually prefers more modern games, but you’ve now got a taste for nostalgia after reading this review, we’d love you to stay right here and play it with us on ukslotgames.com. Secondly, we don’t force you to deposit money when you first sign up. Everybody is welcome to make an account, and you can then browse our entire catalog to find a game you really want to play before you hand over any money. Burning Wins is a fine place to start, but there’s no reason to stop there! In fact, we do the opposite of forcing you to hand over money. When you sign up, you could win up to 500 free spins on our games just for doing so!